It’s midnight in Toulouse and down on the grassy river bank hundreds of young people are sitting in circles, eating, drinking, laughing, playing guitars and singing. A short stroll away In Place St Pierre, crowds are spilling out of the bars into the streets. As we step into one bar a pretty young waitress is telling a gang of French lads at the outside tables that she needs the terrace cleared in five minutes. They exchange jokes about her bossy nature, then obediently trot inside. No temper, no protests, no trouble. Remember that “cafe culture” we were promised when Britain got round-the-clock drinking? Well this is how it’s done. It helps that we’re in the middle of a July heatwave. This southern French city is closer to Barcelona than Paris and it gets a lot of sun. With beautiful art and architecture, quirky shops and fabulous restaurants, it’s is a great destination for a short break – less than 90 minutes from Gatwick with return fares in August from £80. You learn the bloody history of the main church of St Sernin, named after an early Christian bishop whose pagan rivals tied him to a bull and dragged him to his death in 250 AD. The town built a church on the spot where his battered body was found. The present building, in pink brick and white stone with a beautiful octagonal bell tower, was built in the 12th Century. A stone thrown from the roof during the Siege of Toulouse in 1218 killed the crusader Simon de Montfort, father of the nobleman who went on to establish England’s first elected parliament. The tour also takes you inside the huge Capitole town hall, where the main rooms are decorated with exquisite wall and ceiling paintings. Outside in the vast Place du Capitole there are markets on most days, with smart shops and pavement cafes all around. From there you head to the enormous Jacobin Church where the Dominican order of friars was founded in the 13th Century. Lit by beautiful stained glass windows, it is divided down the middle by seven huge stone columns with dark ribs that radiate across the high ceiling like palm fronds. You’ll also find out the locations of Toulouse‘s many art galleries, with priceless works by Toulouse-Lautrec, Picasso, Rodin, Monet, Henri Martin and Modigliani. A separate boat tour of the River Garonne and Canal de Brienne is also worth the €8 ticket price. 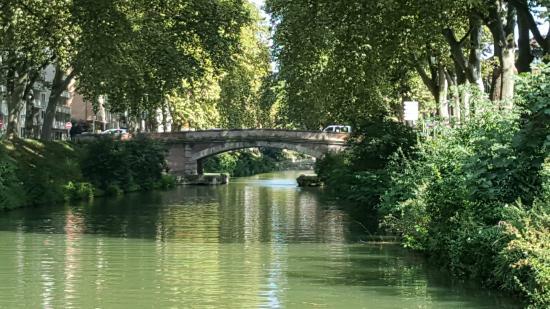 There are fabulous views from both sides of the graceful Pont Neuf and you see the starting point of the Canal du Midi, which meanders 150 miles south-east from Toulouse to the Mediterranean (www.bateaux-toulousains.fr). The commentary is French-only but there’s a printed English translation. 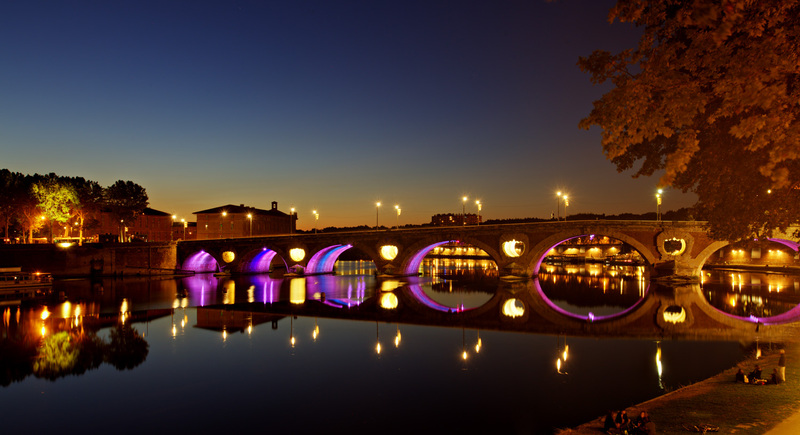 Toulouse is known as “la ville rose” (the pink city) thanks to the colour of its ancient brick buildings, which take on a lovely warm glow in the evening sun. It’s also associated with two other colours – pastel blue and violet. In medieval times most the city’s wealth was based on the trade in blue pastel dye extracted from local woad plants. This came to an abrupt end in 1560 when imports of indigo dye reached Europe. Nowadays this heritage is celebrated at La Fleurée de Pastel, a shop in the Rue de la Bourse where everything – clothes, jewellery, perfumes, candles, towels – is made in subtly different shades of the same authentic dye. A small soap costs €6, eye shadow is €20 and a pastel blue beret costs €22 (www.bleu-de-lectoure.com). Violets came to Toulouse from Parma in Italy in the 19th Century, and quickly became a major enterprise which exported 600,000 bouquets a year to northern Europe. Today there are only a few growers left, but their flowers are used to make everything from perfume (€8.50) to tea (€5) and soap (€4.50), all with the familar smell of Parma violets. The best place to see the full range is at La Maison de la Violette, a shop in a large boat moored on the Canal du Midi. Try a helping of delicious violet ice-cream in the cafe on deck (www.lamaisondelaviolette.com). If rockets and spaceships are more your thing than art and flowers, head for the Cité de Espace, a hands-on space museum and theme park to the east of the town (15 minutes on the No 37 bus from the Jolimont metro station). It has full-size replicas of the Russian MIR space station, a Soyuz spacecraft and a French Ariane 5 rocket, as well as an IMAX cinema, moonwalk simulator and the Gyro-Extrême, a zero-gravity astronaut training seat. It’s huge fun, and you need most of a day to see it (high season tickets €22, children 5-15 €15.50, see www.cite-espace.com/en). On the opposite side of town near the airport is another shrine to science, the high-tech factory where the giant Airbus 380 aircraft is assembled. There’s a 90-minute guided tour, which must be booked at least two days in advance via the website (tickets €14, 6-18s €11, www.taxiway.fr). Where to eat out in Toulouse is an impossible dilemma – the choice is so vast and tempting. The local specialities are cassoulet (meat and haricot bean stew) and porc noir (pork from black pigs). You can get both almost everywhere. Nearly everything here is cooked in goose fat, including the delicious chips. We had excellent meals at Le J’Go, which specialises in lamb (www.lejgo.com, at the bistro Le Nez Rouge (the red nose) where they keep a box of Comic Relief-style noses for customers (www.le-nez-rouge.net, lunchtime set menu for €13.90).Le Velane is a fun restaurant with a riot of leoparskin inside (restaurant-levelane.com, mains from €20) and the shady courtyard at tiny Vert Caramel, is a perfect refuge on a hot afternoon (vert.caramel.free.fr, salads from €9). For an unusual (and expensive) treat visit one of the two Philippe Faur ice-cream parlours (Place du Capitole and Place Wilson,www.philippefaur.com). They make a range of savoury ice-creams including fois gras, truffle and red pepper. I tried a spoonful of the fois gras and it’s delicious. At €29 for a 33cl tub it needs to be! For more information see the impressive English language website at www.toulouse-visit.com where you can book accommodation online. From this week there’s an online family activities section too. There’s a choice of flights to Toulouse from around the country. Easyjet fly from Gatwick and Bristol, BMIBaby from Manchester, FlyBe from Birmingham and Jet2.com from Leeds, Newcastle, Belfast and Edinburgh. British Airways offer weekend flight-hotel packages from £256pp, flying from Heathrow. An edited version of this article appeared in the Sunday Mirror’s Homes & Holidays supplement on August 15, 2010.